Age will be determined by the player’s birth year. The purpose of College Showcase is to prepare players to play at the collegiate level. The team will travel to and participate in tournaments that meet the needs and goals of the individuals. Volunteers interested in serving in this role should communicate with the VP of Select and/or team coach. Frequency: Minimum of 10 matches per season with Cup Play at the end of Spring; however, the number of games is subject to schedule changes by our governing body, weather, and other unforeseen circumstances. Playing Time: FC Thunder strives to provide at least 50% playing time (not applicable to Division I), however, it may be impacted by several factors including punctuality, attendance, and attitude. Home games will be hosted at Boerne City Park. Twice weekly training sessions for 16 weeks; may occur on Monday thru Thursday. Attendance is mandatory. Missed practices may be made-up. 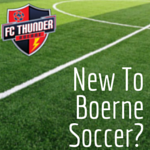 Practices may occur at Boerne City Park or Fields at Adler Road; confirm with your trainer/coach. Teams will be entered into 2-4 tournaments throughout the breaks between the Fall and Spring. In advance of practice sessions and games, players are required to remove all jewelry (eg, earrings, necklaces, bracelets, hard hair bands/clips), sunglasses (recommend using sport glasses, if needed, for medical prescriptions). Optional team photos are scheduled to occur on the second or third weekend of the season, before the scheduled game of the day. Teams may convene for an end of season party at their discretion. This is a great opportunity for us to show support for FC Thunder sponsors by hosting the activity at their facility. We encourage the team to split the cost of the party among all team members. Trophies are earned as a result of winning tournaments and/or age-group specific division.